Following on from surprisingly weak exports in August, industrial production growth slowed to 2.2% year-on-year in that month from 2.6% in July. The outcome was slightly weaker than the consensus, which centred on 2.3% growth, with estimates ranging from our low-end 1.6% to 4.5% YoY. Manufacturing and utilities dragged headline IP growth lower, while mining continued to contract albeit at a more moderate rate than in July. Among other manufacturing indicators including sales, employment in the sector and wages, all posted slowdowns in August. Manufacturing sales growth of 8.1% YoY was down from 9.6% in July. Wage growth eased to 9.7% from 10.1%, and jobs growth to 1.9% from 2.0%. 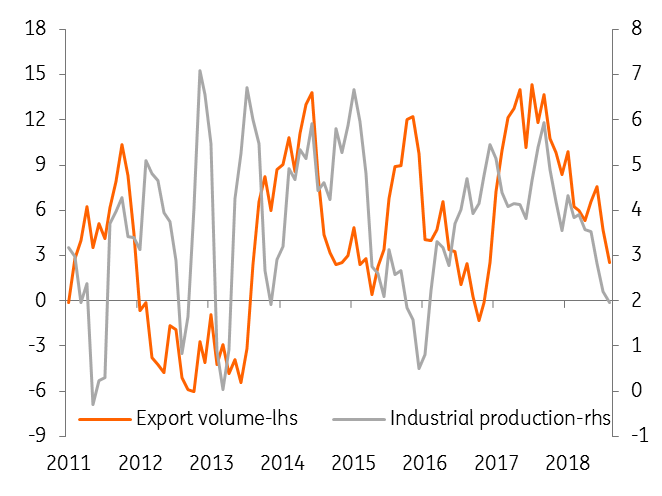 Both exports and production growth are slowing on a trend basis (see figure), which will be associated with a slowdown in GDP growth. The high base-year effect also has been in play in driving the GDP slowdown. We expect GDP growth to settle around 4% in the second half of the year, for a full-year average growth of 4.5%. Our forecast for 3Q remains at 4.1%. With the economy enjoying the lowest rate of inflation in Asia the central bank (Bank Negara Malaysia) has greater policy leeway to support growth in the period ahead. Earlier this week, BNM Governor Nor Shamsiah Yunus expressed confidence about robust private sector activity continuing to support the economy into 2019 even as global trade tensions weigh on exports. However, we believe the tighter fiscal policy stance will be a potential headwind to growth. The government is considering new taxes and asset sales to make up for the revenue loss from scrapping the Goods and Services Tax and to repay its debt. We maintain our view that BNM will leave the rate policy on hold through 2019.